Once again, captivated by a food story in the New York Times. Today it was about my favorite hot sauce, Sriracha. It's Asian, but it's made in Southern California. It's peppery but not too. It's garlicky, and yum. Since I first discovered Sriracha, back in the 1980s, I've been putting it on tostadas, which are not Asian at all, though they happen to thrive under a squizzle of garlic-chile sauce. Eventually Sriracha became more widely available, and I've had some in the fridge ever since. Yes. You actually do get to the bottom of a bottle now and then. I did my best today, by drizzling some all over tostadas for lunch. i lurv sriracha and will put it on almost anything. i had to cut back last year because i thought i was becoming too fragrantly garlicky, though. That article was really great. I just bought a new smaller bottle. the big ones last forever. never w/o a bottle - but then again, who isn't these days. it's a pantry must. i am on my way to go eat a bowl of pho right now - there will be a bottle right on the table when i get there... will think of you. Being a novice to the concept of eating things that I didn't grow up eating, I've been a scaredy cat about sriracha. But I finally bought a bottle-let's see-3 weeks ago. Still haven't opened it. But as soon as I get over this #$&* cold, and can taste things again, I'll try it. I never thought about eating it on Mexican food - but why not? As I get older I eat spicier and spicier - are my taste buds getting worn out? Thanks for the idea. Pea: Can we make Sriracha ice cream? Didn't think so. Greg: Good read, huh? I haven't discovered the smaller bottles! Shopping list! Cyndi: Good for you, trying some. Squeeze a little onto your finger and lick it. You'll be captivated. i dunno. i have had chili ice cream...a little smoky, a little hot, and creamy. not sure i would go out of my way for it again, but it wasnt terrible either. i wouldnt put sriracha prematurely on the 'do not do' list. Pea: Holy What an Idea! Thank you. I read that piece too! And then I promptly pulled out one of our bottles of Sriracha (yes there are multiple)and squirted it into my black bean soup. Oh yes. bliss. One of my favorite condiments! I can't remember when I first started using it but now I always have a couple of bottles on hand so that when one bottle runs out, I have another one waiting. The thought of having no siracha to put on my food is just too awful to contemplate! We always have a bottle of Sriracha in our fridge and put it on everything from pasta to burgers! It's especially good on pizza if you haven't tried it yet. I grew up in a neighborhood with lots of Asian markets but was surprised to see it at even Target nowadays! I guess people couldn't get enough of it! Zoomie: Language is fun. We haven't had that conversation, you and me, enough yet. I bet we could drive a roomful of partiers crazy. Nancy: It's funny how something so (relatively) new becomes indispensable. I actually still know people who haven't eaten it yet. Party on. Dang, you did it again! Splollup. Just right. Zooms: I was showing off for you. So flattered you noticed. Black bean soup! Love it, thanks. Anyone remember the counterfeit Rooster Sauce scandal of a few years ago?? Wish I saw a smaller bottle. Like the Three Crabs fish sauce I bought today; I will have to live to be at LEAST 427 to go through it. More fruits and veggies, then. Went looking on your recommendation - didn't find it yet, but I persevere. Zoomie: Oh, you'll find some. Not sure if you're the hot sauce type, but you're saucy. So keep trying. Orangette's Cabbage! Yeah, isn't that the coolest recipe? Thanks for bringing the idea of it over here to my other lurkers... Hee. Wow, tons of comments! My hubby loves it and makes his own, which he prefers to the "rooster sauce" squizzle. What an awesome word, I will steal it and use it too. Katie: I totally remember your husband making the sauce! He did a good job. But there's not really tomatoes in it. Still, yummz. "Squizzle" is now officially a word in the blogosphere for all to use. MusingEgret: First, what a lovely name. Second, wow, thanks for the link. I don't visit the Couple as often as I should. I love your ideas, especially on shrimp. Mm. Please lurk more! And de-lurk now and then. Katie: I'm looking at White on Rice Couple's recipe, and indeed they use tomatoes. Sorry for being a wrong-headed boor. Even so, the Rooster bottle does not list tomatoes in the ingredients. What a gorgeous photo! The dripping sriracha totally makes it for me. Wish I could reach in and grab that for dinner. Sandwich: Why, thank you! 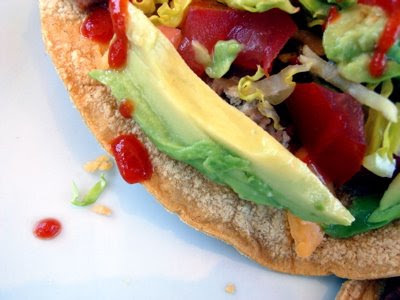 The drops of sauce were much cuter than the sloppy tostada.